John Kugelberg and Will Cameron, ed. A suitcase of Angus MacLise’s artwork, publications, and manuscript as well as more than 100 hours of recorded music was left with La Monte Young and Marian Zazeela for safe-keeping thirty years ago. This extraordinary time-vault is the foundation of the exhibition DREAMWEAPON, with additional materials drawn from private previously unseen collections and archives. 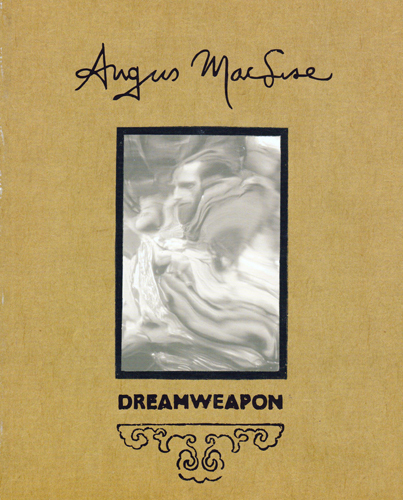 The standard edition of the DREAMWEAPON exhibit catalog features texts by Lou Reed, La Monte Young, Ira Cohen, plus exhibit curators Johan Kugelberg and Will Swofford Cameron. This edition includes a laid in memorial letterpress broadside commemorating Ira Cohen, reprinting a 1976 ode to Cohen by Angus MacLise. The broadside printed by Jon Beacham/The Brother In Elysium Press.